At the Newman Law Firm, we represent clients throughout Greater Houston, Texas, in estate and probate administration disputes. With a combined 60 years of litigation experience, our team of attorneys has the knowledge and skill to protect your rights and interests. The probate process is very complex. For trustees, beneficiaries and executors alike, working to properly administer a loved one's estate can be a daunting task. Although you want to ensure that the wishes and directives of the estate are executed as intended, you also want to be certain that your individual rights and interests are protected. We understand what you are going through, and we are here to help. 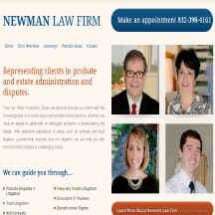 We are not your typical probate litigation firm. We are a small firm with big experience. Our attorneys work with clients one-on-one for the life of their case. We believe that personal dedication is important to a positive resolution. We are here not only to be your legal advocate, but your trusted advisor as well. When you come to the Newman Law Firm for your initial consultation, you will meet with a skilled attorney to discuss your situation. After taking the time to listen to your story, we will give you our honest and straightforward opinion as to our expectations for your case. We are extremely goal oriented, and we will work tirelessly to stand up for you and your rights.